LA Galaxy goalkeeper Jon Kempin (center) with team mascot Cozmo, members of the LA Galaxy Star Squad, and Gift of Life Campus Ambassadors at the Kick Blood Cancer event. Gift of Life Marrow Registry partnered with the LA Galaxy Foundation to host Kick Blood Cancer Day at The Grove in Los Angeles on Sunday, August 13. 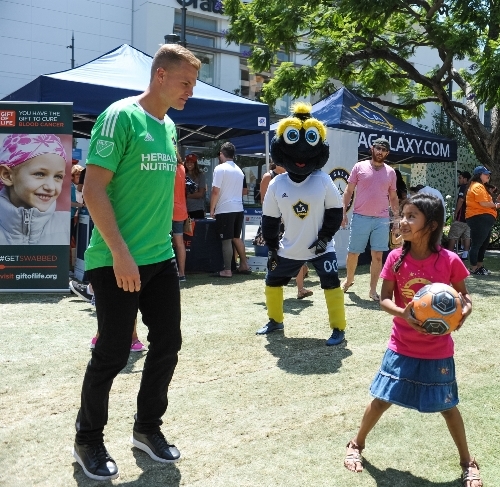 The major league soccer team was represented by goalkeeper Jon Kempin, team mascot Cozmo and members of the LA Galaxy Star Squad. Kempin, 24, played soccer with youth who attended, posed for photos and signed autographs. He along with Cozmo and the Star Squad swabbed the inside of their cheeks to join the registry. The LA Galaxy signed Kempin, a former Sporting Kansas City goalie, on March 3, 2017. He joined the LA Galaxy after six seasons in Kansas City, where he signed as the club’s first Homegrown Player in August 2010. By chance, Jonah, a recent Gift of Life donor, was at The Grove with his family and stopped by to say hello. A history major at Columbia University, the 21-year-old joined the registry in January 2017 while on a Birthright trip to Israel. He got the call that he was a match only a few months later and in June donated peripheral blood stem cells to a patient battling leukemia. In addition to playing soccer with one of the team’s star players, kids enjoyed face painting and arts and crafts activities. 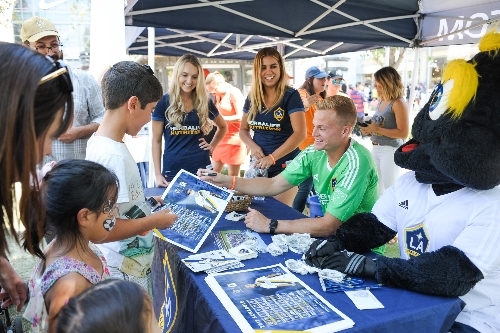 Star Squad members greet young fans as Jon Kempin and Cozmo sign autographs. Fun for the kids included face painting, playing soccer with Jon Kempin, and other activities. 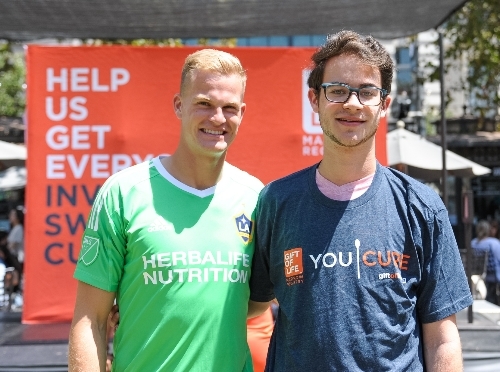 Gift of Life thanks the LA Galaxy Foundation, The Grove, Jon Kempin, the LA Galaxy Star Squad, “Cozmo”, and our six Campus Ambassadors who came to support the Kick Blood Cancer event.